LE-AMP-MRS-70 is a tiny yet powerful, high quality super-efficient audio power amplifier. Built upon the Infineon MA12070, features unparalleled power efficiency with low integrated noise and low THD. 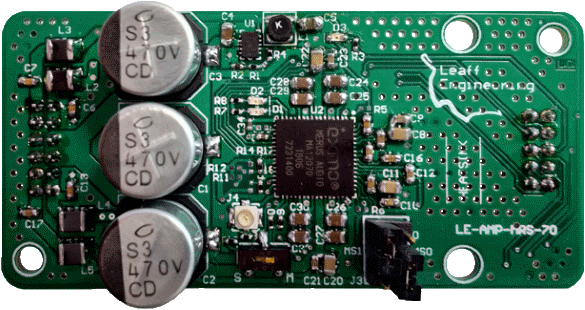 LE-AMP-MRS-40 is a tiny yet powerful, high quality super-efficient audio power amplifier. Built upon the Infineon MA12040, features unparalleled power efficiency with low integrated noise and low THD. Thanks to its compact design, it can be easily integrated in existent projects as a "plug-in" module. Optionally a sophisticated security mechanism can be activated to transform the LE-AMP-MRS-40 into a hardware protection key for your project. Ask details for further information. LE-AMP-DB-01 is a daughter board to easily connect LE-AMP-MRS-40 and LE-AMP-MRS-70 and test performances in Bridge Tied Load (BTL) configuration (2 audio channels) or Parallel Bridge Tied LoadPBTL (1 audio channel). I2C interface for external registers control.